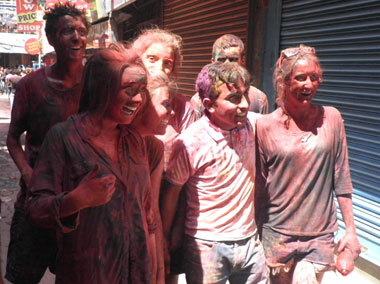 Holi or 'Fagu', the festival of colors, is being celebrated in Nepal on Tuesday 26th March 2013. Especially, youngsters and kids pelting water balloons and pouring coloured water on each other is a common sight in the streets of Kathmandu today. Now a day tourist also are celebrating the festival in Thamel, Durbar Marga. It's a government holiday today. Holi begins on the eighth day of the new moon and ends with the burning of the "Chir', a wooden pole draped in flags that is considered pious, on the full moon day later today. The festival is celebrated in hilly areas of the country including Kathmandu valley today 26th March and tomorrow 27th March in Terai areas. The government of Nepal give holiday in Tarai areas on 27th march. The number of foreigners visiting Nepal in the month of February has increased by 6 percent compared the same period last year. According to the figures released by Immigration Office, Tribhuvan International Airport (TIA), 45,123 foreigners visited Nepal via the aerial route in February. There was a growth of 135 percent in the Chinese sector while visitor arrivals from Malaysia and Singapore registered a robust growth of 288.1 percent and 119 percent respectively. However, arrivals from Japan, South Korea and Thailand registered a negative growth of 20.1 percent, 29.4 percent, and 0.3 percent respectively. The arrivals from South Asian region have recorded negative growth of 15.2 percent with Pakistan (44.3 percent) and Sri Lanka (35.3 percent) registering positive growth. Visitor arrivals from India, which is the largest source market for Nepal witnessed decline by 18.2 percent and arrivals from Bangladesh declined by 5.3 percent. European markets registered negative growth of 5.5 percent with major destinations showing mixed reaction in terms of visitor arrivals. Tourist arrivals from the US, Canada and New Zealand increased by 11.2 percent, 42.2 percent and 44.8 percent respectively. However arrivals from Australia have decreased by 5.5 percent. A total of 48,783 foreign tourists departed from TIA in February. The number of Nepalis arrivals stood at 58,379 while 70,635 departed from TIA last month. Kathmandu has been ranked fourth on the list of least expensive cities to live in, according to the latest Worldwide Cost of Living Survey from the Economist Intelligence Unit. While South Asian locations dominated the cheapest cities to live in, East Asian now now make up 11 of the world's 20 most expensive cities. No U.S. city made the top 20. Tokyo bagged the title of most expensive city as it overtook over from the Swiss city of Zurich, which dropped to seventh from the top last year. Australian cities were among the biggest movers in the top 10 most expensive cities.The Venezuelan city of Caracas rose 25 places to ninth, making it the most expensive city across the Americas. According to the survey, the Canadian city of Vancouver is the most expensive location in North America, at position 21. Los Angeles and New York City tie at 27th as the most expensive U.S. cities. The Worldwide Cost of Living survey is released twice a year by the EIU and compares hundreds of prices across 160 products and services, including items such as food, drink, rentals, utility bills, schooling costs and household supplies. If you are set for a multi-day vacation spree outside the country, finding a way to call home could be a struggle if you are not prepared. Many countries still do not have widespread Internet access, sometimes even no Internet (or phones) at all. There are many ways to call loved ones at home while you are out of the country that are not only convenient, but also cost close to free. Localphone – This service works similarly to Skype, enabling you to call family and friends via the Internet. The difference with www.Localphone.com is that it offers much cheaper international call and text rates. Calls to United States costs just half a cent per minute, regardless where you are calling from. Students even get a bonus for funding their account. It is available on both iPhone and Android smart phones. Calling cards – Many countries offer prepaid calling cards that allow you to call home using a local landline or smartphone. Although its basic rates are low, check if they provide even lower rates on off-peak hours. Also, certain phones require specific cards and check whether rates are increased if calls are made from mobile phones and pay phones. These can be bought in convenience stores. World Travel Awards (WTA) has announced that the new Conrad Algarve will host its Europe Ceremony 2012 on 6 October 2012. Senior representatives from Europe’s finest travel brands are scheduled to attend the gala evening as they vie to win the most coveted accolade in the industry. The red-carpet ceremony is being held in partnership with Truism do Algarve and Conrad Algarve, and will include a gala dinner, top entertainment as well as the presentation of the most coveted awards in the industry. Guests also have the opportunity to participate in the WTA Europe Golf Classic tournament which will be played on the region’s finest championship course. Set on a dramatic stretch of Portugal’s Atlantic coastline, the palatial Conrad Algarve combines exquisite style and contemporary luxury with all the conveniences of a sophisticated modern retreat in a stunning location. The WTA organizers highlight the contribution the significance of hosting the event in the Algarve. Gurgaon, and New Delhi, India on 12 December 2012.